Sherpa Glacier, 25.2 miles round trip, dark to dark, 6k vertical. Sunshine. Exhausted. I'm pretty stoked to sneak in a big day at the tail end of our weather window, especially with all the mixed forecasting. 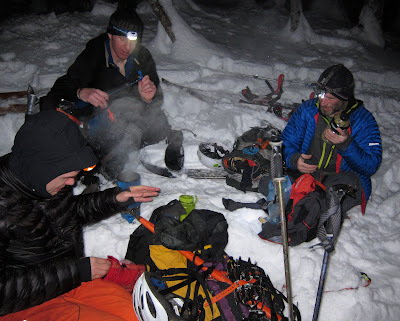 � � Powhound, Alecapone, bs, and I drove out to the TH thursday night and decided to bivy at the TH versus 4 miles in. Instead of setting up tents we managed to bivy on somebodies snowmobile trailer. It even had a hood! Drifted in and out of sleep for three to four hours before easily getting up and moving around 4:30 am. 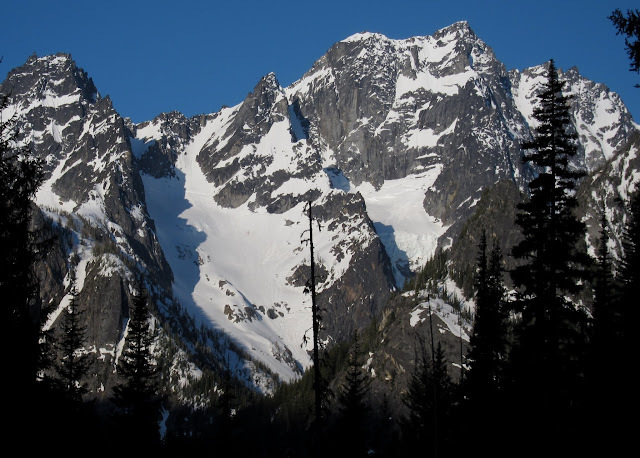 � � The approach up to the Colchuck lake trail fork was a super highway even with banked turns. 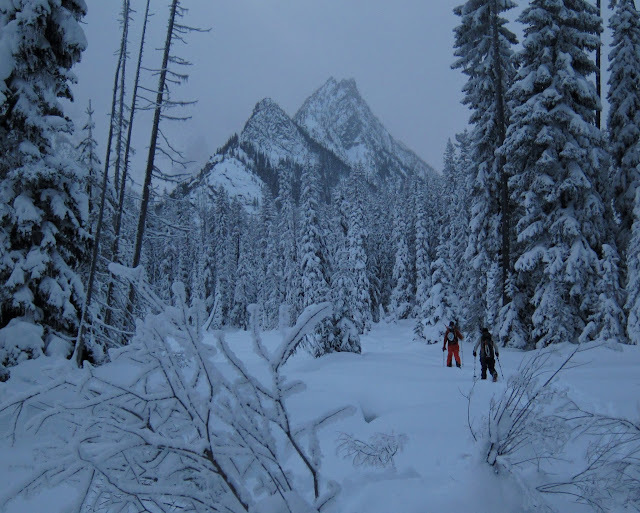 After that we followed what looked like splitboard tracks until it looked like they were heading to stuart lake. 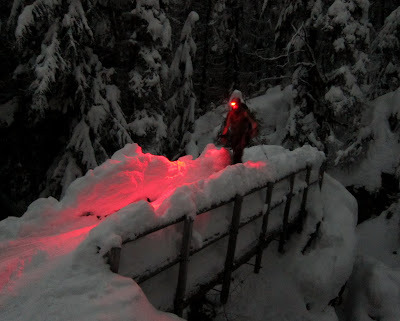 Thats when we started breaking easy trail through light powder toward mountaineers creek. This is where Alecapone's experience really payed off, since he knew how to make a relatively straight trail without any boulder shenanigans. It probably saved us 30-40 minutes of approach time. � � We ended up meeting with the split boarders(?) skintrack at the base of Argaunot, and briefly wondered what they were riding on argonaut or sherpa peak, before making or way up mountaineers creek to the base of mighty and intimidating stuart. Travel up Sherpa glacier went pretty fast. Skinned up midway, booted a steeper mid section, then switched back to skinning until we reached the bottom of the sherpa couloir. Bootpack ben went up first and absolutely killed it. � � Timing wise we started at 4:30 am, reached the base of the sherpa glacier at 10:30 maybe 11, and reached the top of Sherpa couloir at 2:45? 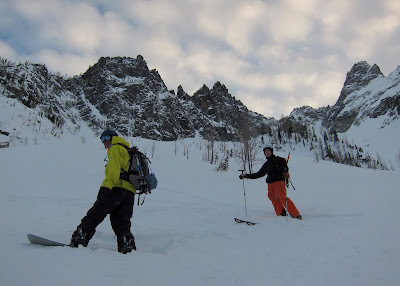 We decided to spend a little time enjoying the alpine splendor from there versus running up to the summit of stuart without skis with limited daylight. Rainer and Adams were out and the inversion clouds looked super low. � � Then it was time to enjoy our efforts. 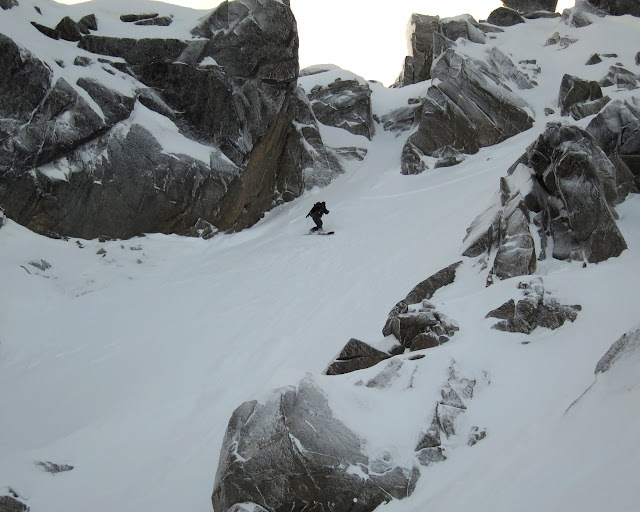 The best snow was in the couloir, with about 4-5 inches of settled/windbuff pow. Steep fun turns with tired legs . 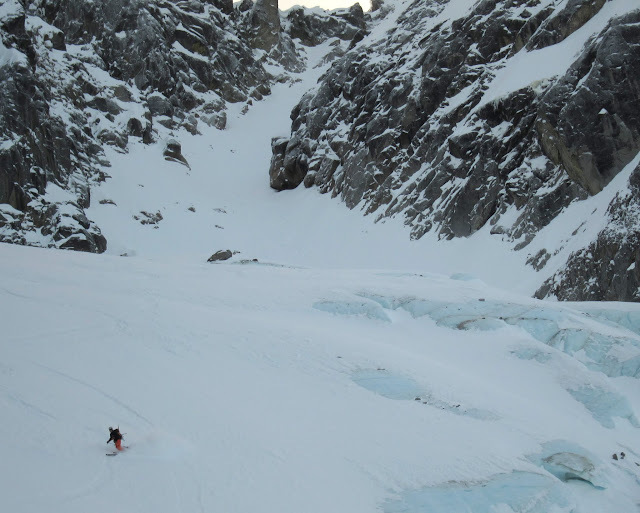 The rest of the glacier was more wind effected and only 2-3 inches of ski penetration. 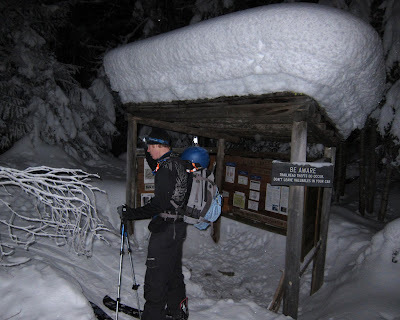 The ski out went fast in darkness, and I think it only took us 4 1/2 hours with a jetboil break. Beautiful stars! � � Thanks for not going to canada and joining me for a rad day! � � Sorry, I managed to not bring a photo taking device, but B.S. was designated photographer and powhound brought along the gopro. So hopefully more to come. Well Done! 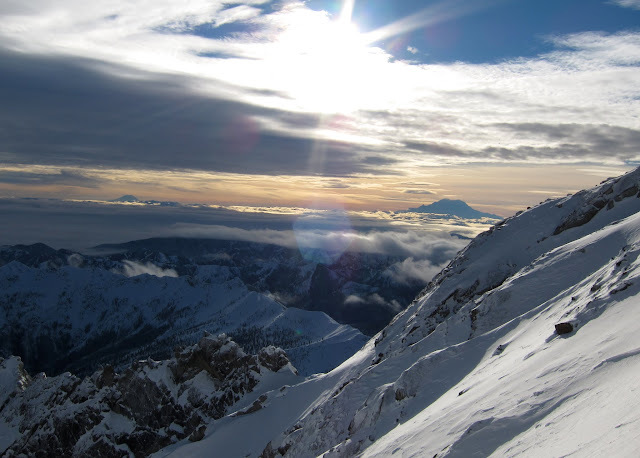 Don't you wish you got another 3 or 4,000' of skiing for that 27 miles you put in? I'm tired just thinking about the approach/deproach. Approach is long but shot blocks, scenery and being able to ski down the summer trail and road make it ok. But yes... next time im there I'll have to check off some of the closer mountains. It was a huge day. Got home at 2am, and decided to unload the truck when I woke up...I would usually at least take my splitboard out of the back and inside. Luckily it was still there when I woke up at 11:30. 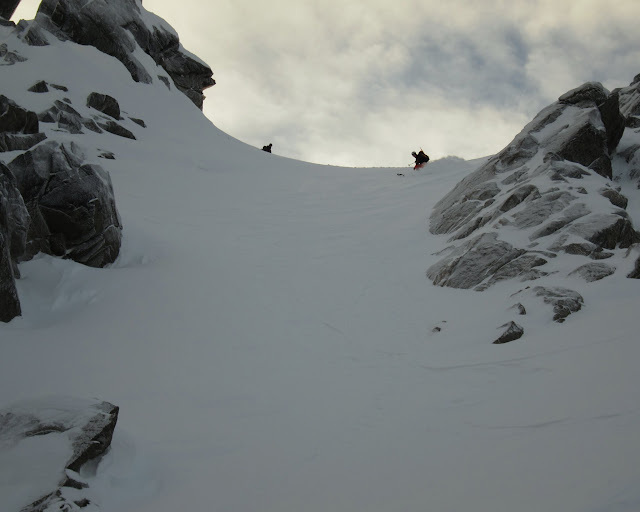 It was a great day with perfect skinning weather. Got a couple pics, and a video later. 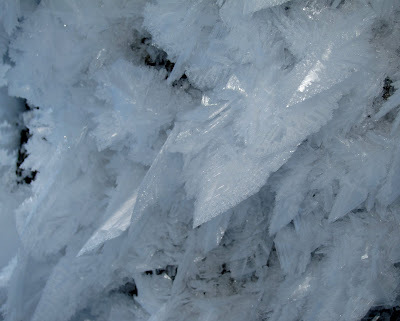 One is of the largest hoar crystals I've ever seen they were like 2" leaves of feathers. The picture didn't turn out so well, maybe BS has a better shot. Thanks for the invite and driving! I'm familiar with the trailer where you bivied. I assume you guys know the owner and didn't just poach it. You did leave an empty bottle of Bullitt Bourbon in there though. Ha. back in may, leyland and i made our first attempt to climb the sherpa glacier.� however, we aborted the trip due to a cut i sustained trying to ski the approach trail in the dark.� i shot this photo in the morning before we retreated, and have vowed to come back ever since. 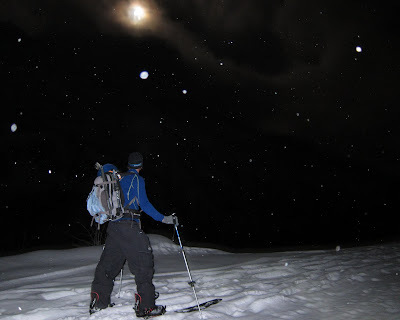 i didn't expect to be coming back so soon, but with conditions pretty prime for an alpine adventure it was hard to resist, even knowing that we'd have an extra 4 miles of road to navigate on the way in.� fortunately, the skin up 8 mile went pretty quickly thanks to the sled tracks and moonlight. it seems a little strange to pass a trailhead when you've already been skinning for a few hours. leaf-sized hoar frost...� flash macro photography with gloves on is not my forte. 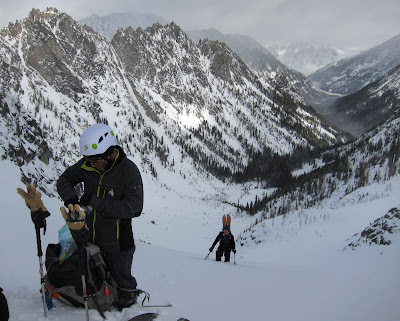 the thin couloir in the background captivated us for a minute, but we were quickly above it. the views alone were worth the 11 hour travel time! but then we got to ride, too! dusk was just setting in as we reached the bottom. time for a quick break and then we cruised the exit in just over half our approach time. 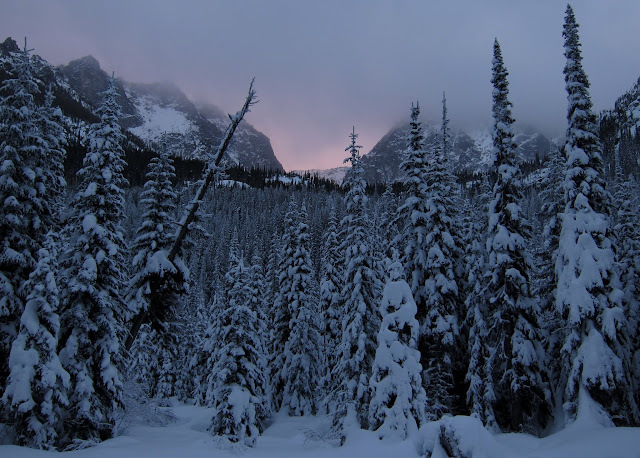 huge thanks to leyland for pulling the true crux of the trip--the drive home over steven's pass! Great trip, report and pics gentlemen. Another photo appears that makes it look like the balancing rock is not the true summit of Sherpa. 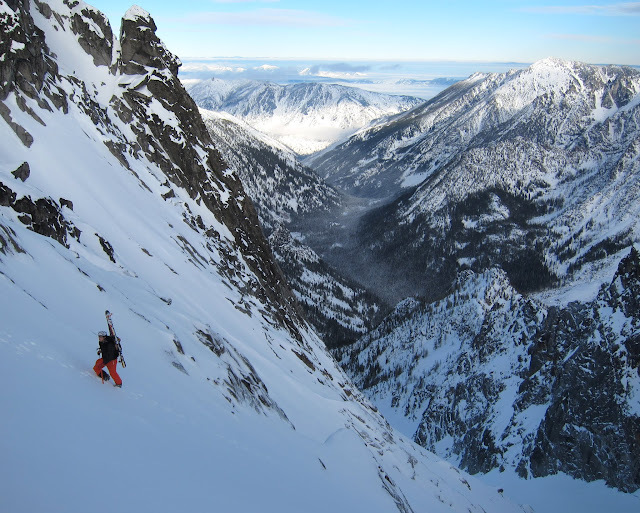 Applying the commitment and duration of alpine climbing to ski mountaineering. Kudos gentlemen. That is how it is done. Glad to see to the bridge is getting packed down - it was pretty scary cross it on the 24th! no kidding! For some reason I decided to cross the second bridge instead if following your tracks. Was it as scary as this? not quite that bad since it didn't collapse. Looks like another epic, nice work! 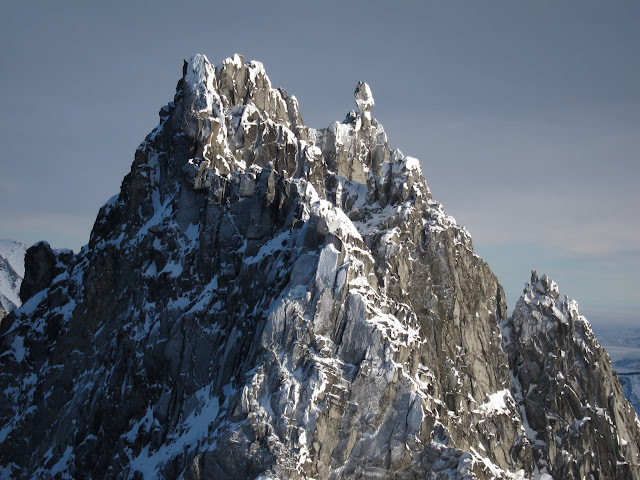 Love the picture of balance rock on sherpa, one day I want to to get on top of that thing. Great write up and photo guys! What a treat for a midwinter day. Love the photos as usuall. Not so bitter that I didnt go to canada now. Thanks ryan, but this trip was all leyland's doing. My contribution was only navigating all of a mile or two through mountaineers creek. Funny video. From the tr, it Sounds like they skied the couloir we where looking at on the way up? It had a cool window at the top.